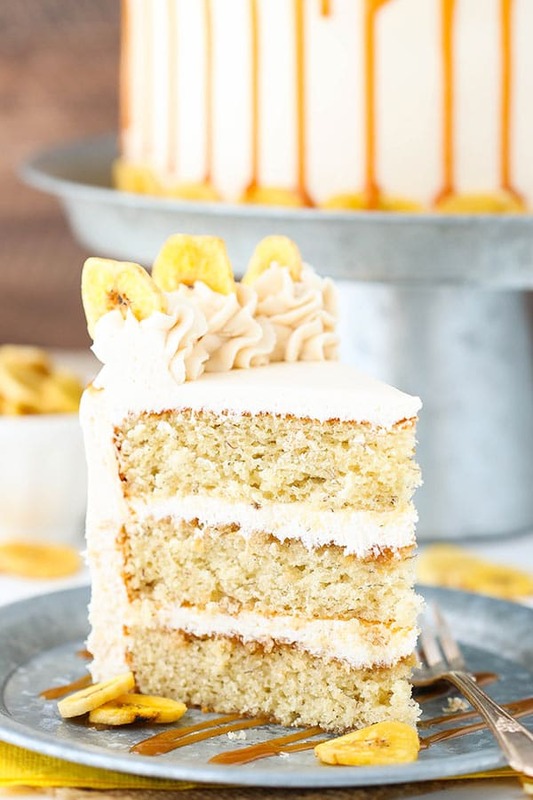 This Caramel Banana Layer Cake is delicious! Moist banana cake layers covered in caramel sauce & frosted with more caramel frosting! Two of my favorite things in one awesome cake! You may or may not know this already, but the hubs and I started dating back when we were 17 – babies! Our first date was to a movie – “The Road to Perdition”. I couldn’t tell you at all what the movie was about and I don’t think he could either. We were both sitting there the whole time wondering if and when he’d hold my hand. It took him until the very last 5 minutes of the movie, but he did it! And I can’t blamed him for wanting this cake all to himself. If I weren’t in the process of trying to eat healthy, it would have been all mine. 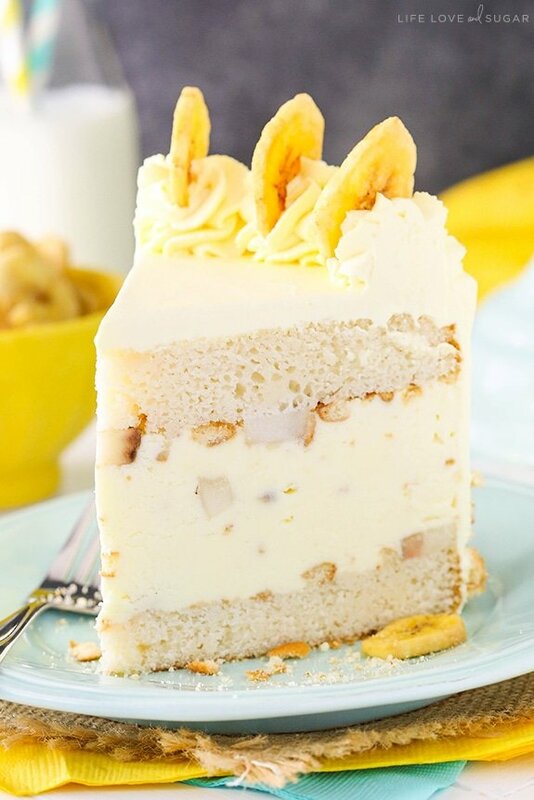 The cake layers are made with mashed bananas to give it that wonderful banana flavor. It’s super moist and SO good! They are then covered with a layer of my favorite homemade caramel sauce. Along with the caramel sauce, the cake is filled and frosted with caramel frosting. It’s a wonderful combination! 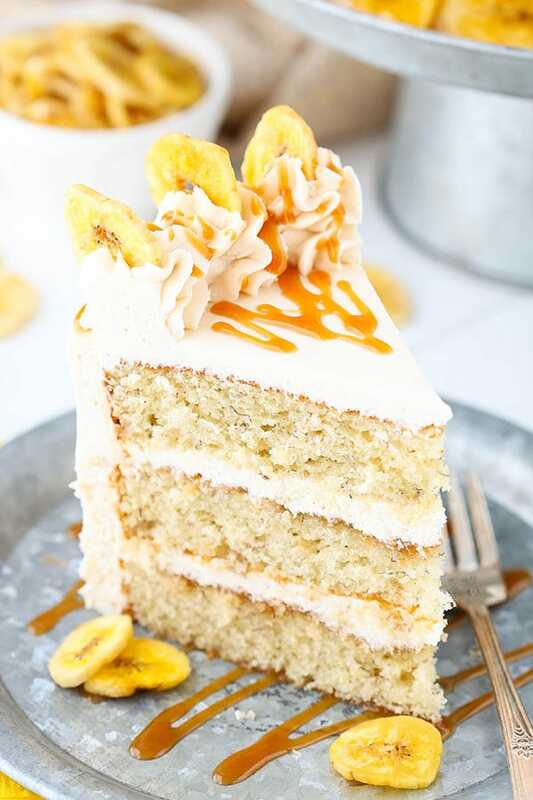 The moist and fluffy banana cake is perfect with all of the caramel. 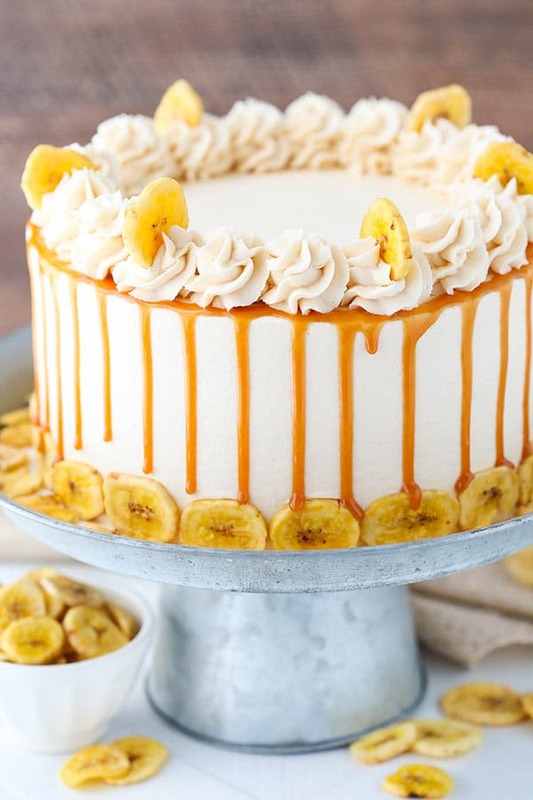 It’s a fabulous cake for all us banana lovers out there! 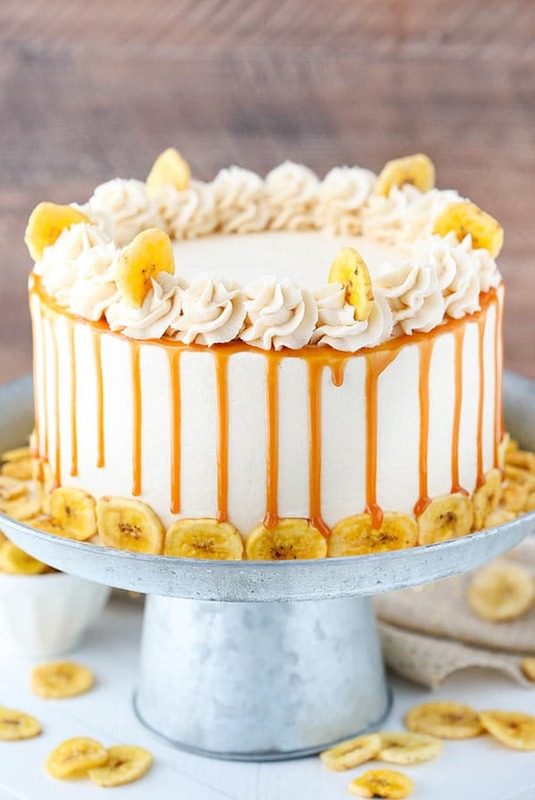 Moist banana cake layers covered in caramel sauce & frosted with more caramel frosting! 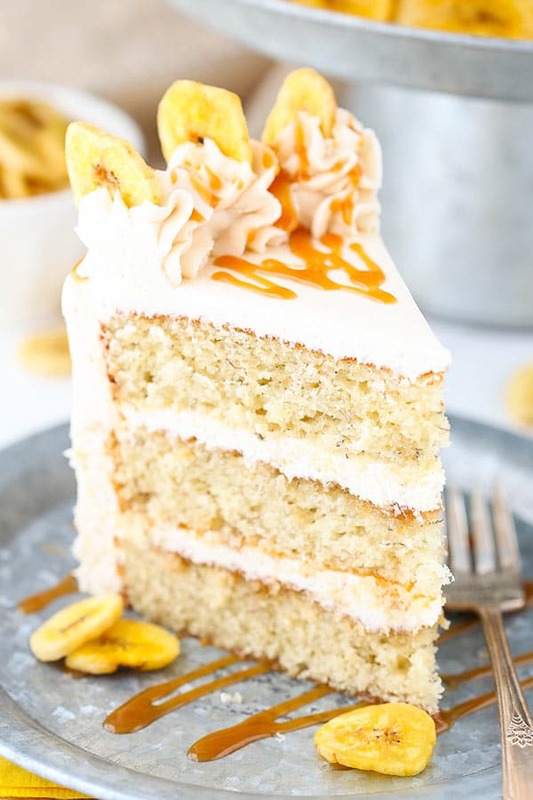 This awesome Caramel Banana Layer cake is a must try banana dessert. 2. Slowly add about half of the powdered sugar, mixing until smooth. 3. Add the vanilla extract and the caramel sauce and mix until smooth. 4. Slowly add the remaining powdered sugar and mix until smooth. 5. Add the water (or additional caramel sauce), as needed, and mix until smooth. 3. Add 5-6 tablespoons of caramel sauce to the top of the cake layer and spread evenly over the cake. 4. Add about 1 cup of frosting on top of the caramel sauce and spread into an even layer. 5. Add the second layer of cake on top of the frosting. 6. Add another 5-6 tablespoons of caramel sauce to the top of the cake layer and spread evenly over the cake. Add another cup of frosting on top of the caramel sauce and spread into an even layer. 7. Top the cake with the remaining layer of cake. 8. Frost the outside of the cake with the remaining frosting. For help getting a smooth finish, refer to my tutorial. 1. 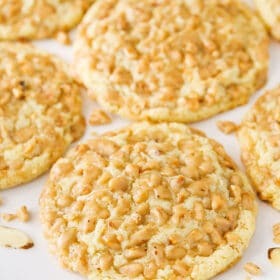 Place banana chips around the bottom edge of the cake. 2. Use the remaining caramel sauce to drizzle around the edges of the cake. 3. Use the remaining frosting to pipe swirls of frosting around the top edge of the cake. I used Ateco tip 844. 4. Place a few banana chips around the top of the cake. 5. Because of the caramel sauce, you may want to refrigerate this cake. I recommend storing it in an air-tight container. Cake is best served at room temperature. Cake is best for 2-3 days. 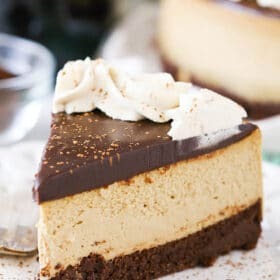 * I made a full batch of the caramel sauce linked to above for this recipe and had just enough to use it in the frosting, on the cake layers and to drizzle around the cake. Feel free to use another caramel sauce, if you prefer. I’d recommend something that is soft enough at room temperature that you can scoop it, but firm enough that it would stay in place on a spoon. When adding the caramel sauce to the frosting, it’s best if the caramel is at room temperature so that you can accurately see what the consistency of the frosting is as you’re making it. My mouth has already started watering Just by looking at the images. I am definitely going to make it. What a great idea to add caramel! 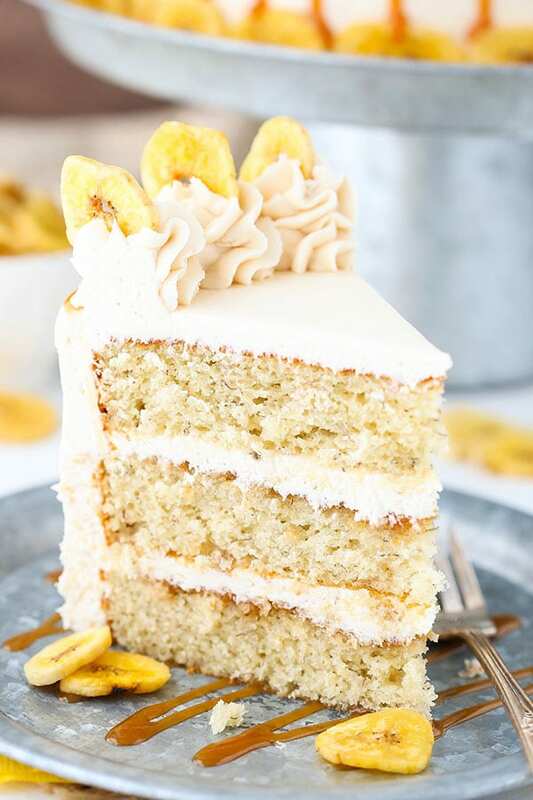 I made your ‘Banana Cake with Cream Cheese Frosting’ and it was absolutely delicious! I have to make this cake with the caramel on the cake and in the frosting! Yum! Can’t wait! Thanks for all the amazing recipes! If I wanted to substitute the butter in the recipe with oil, what would the conversion be? I’m so glad you like the vanilla cake! It would be hard to say how to substitute the butter for oil in this cake without testing it. It can change the recipe quite a bit. I have alway’s wanted to text you and let you know, You are very talented, your baking is breathtaking!!! Thanks Lin for this recipe. I Have been looking out for a perfect banana cake recipe and I this is it though I have not tried because your recipe never Fail. Please I want to know if this cake can be covered in fondant. Thank you. Can we cut down on the powdered sugar? Ten and a half cups plus the caramel sounds way to sweet. How do you keep bananas from turning brown? You can, you’ll just end up with less frosting. The powdered sugar adds volume. If you use salted butter with the shortening (or half salted butter and half unsalted, if you’re using all butter), it helps cut down on the sweetness. 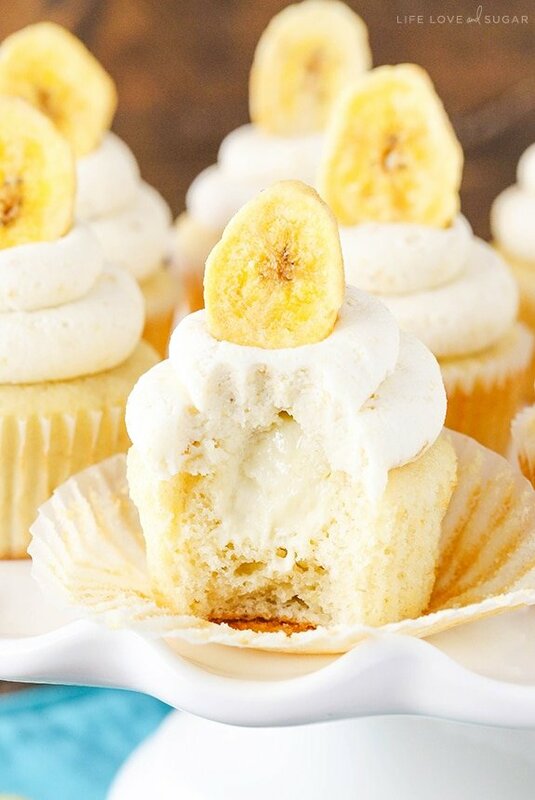 The bananas on the outside are banana chips, so they don’t brown. Where do you get banana chips? Are they the dried chips you can find in the grocery stores or do you make those yourself? If so how do you do that ? I buy them at the grocery store. this was too yummy and loved this one….. The cake looks so great. Can i ask what kind of shortening you use? It’s not common to use shortening i Denmark and only know Crisco. Crisco is the brand I use. However, you can replace it with additional butter if you prefer. Do you think colouring the banana cake would work? 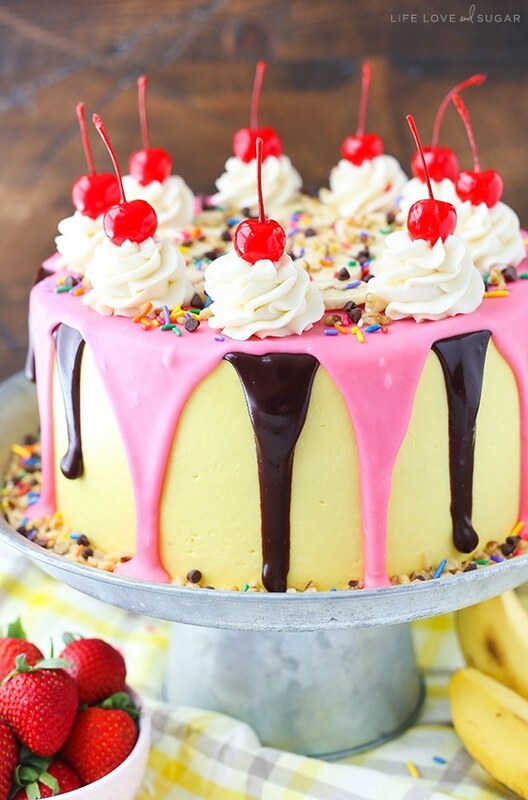 I want to make a purple ombre of layers inside my cake, but don’t want to use standard vanilla cake to be able to colour it. The cake has a bit of a yellow-brown color to it, so the purple wouldn’t be a true purple. I just made this. I really don’t like using shortening so I used butter – salted and unsalted. I used HALF the powdered sugar and I still thought it was kind of sweet. Does the shortening make a huge difference? Did I do something wrong? There was definitely enough frosting for the cake. Having said that – I’m a novice baker so I’m sure all errors are mine. I certainly was not able to frost it as you did but I’ll work on that. Hi there! I like tall cakes (5″) and torte my layers so I have 4 per cake. I made this recipe today using only 2 cake pans and will not have the height to torte. How tall are your cakes just for reference? I yielded 8c batter from the recipe – split it evenly between 2 8″ pans… and the cake layers are about 1.5″ tall each. Does this sound right? It seems about right. I would say that when I make 3 layers, they’re each about 1 inch in height. So 1.5 inches for two layers seems right. My cakes usually end up around 3.5 to 4 inches in height once I add fillings. You might want to adjust the recipe to add another layer (either 1/3 or 1/2 of the recipe, depending on preference). 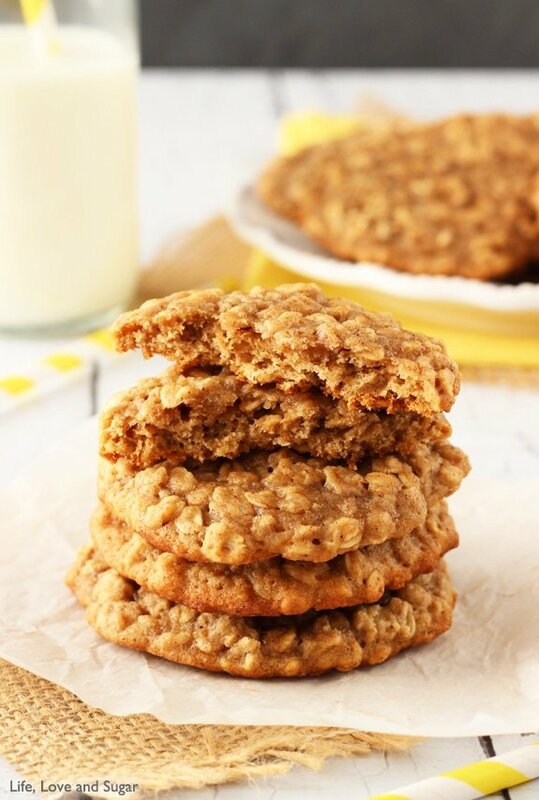 Hi Lindsey – I’m new and naive to baking. I like your blog. I tried your moist vanilla cupcakes and they turned out very good. I received a lots of compliments. Thanks to you. So after that I used the same recipe for baking a layer cake at 350 F. After baking for 35 mins (which is when I saw that the toothpick inserted doesn’t have any crumbs) my cake has a dome and the sides of the cake are a bit hard. Can you please suggest any tips to avoid the dome and hardening of the sides. 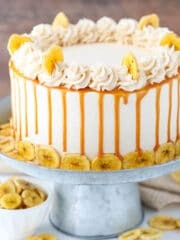 I also have another question – in some of your recipe’s you say add dry ingredients to wet ( caramel banana cake) and then i some other you say add wet to dry (like in almond joy layer cake ). Is there any specific reason for the difference in the method. My cakes often have a dome, which I like because then I can level them the way I like. You could try using something like Wilton Bake Even strips though if you’d prefer not to have a dome. It depends on the recipe. There may be a reason for some, but not others. Hi Lindsey!!! I don’t find sour cream in my place…can I substitute with anything else? ?kindly help out..thank you…. You could try yogurt or using additional milk. I’m soooo impressed with your baking AND decorating skills!! You’re an amazing Baker. My 32 year old daughter saw your banana Carmel cake on pinterest and asked me to make it for her this past winter. This cake is delicious!! The next time I made it I did cut down on the powdered sugar, but for the volume I used some cornstarch, it helped cut down on the sweetness. Some folks might not care for the cornstarch but for us it worked nobody knew the difference. Oh my cake didn’t come close to looking as pretty as yours but it tastes great. Hi Lindsay, I’m a bit of a novice to cake making too ??? ?, just have a question re making the layer cake, -do you have to make separate cakes for the layers or could you make 1 whole cake & cut it into 3rds etc? You’ll want to bake them as separate layers or it will take too long to bake and not rise properly, giving you a very dense cake.